RSI (repetitive strain injury) is a term that most people have heard of because it has become a very common side effect of our modern lifestyles. The fastest growing group of suffers are those who spend long hours in front of their computers. The repetitive nature of typing combined with excess sitting, makes them very vulnerable to an RSI. In simple terms, an RSI is an injury caused by a repeated action that develops over time. Most sufferers have warning signs that something is wrong long before the injury becomes chronic. The problem is, most people also carry on doing exactly what they always did, and hope that the “annoying niggle” will just go away. Many times it does not! Picture this, your job/hobby involves lots of time using a computer. You’re not a “professional” typist so you are probably sitting on the chair that happens to be closest to the table or desk that you work at. You may be working on a laptop, but even if not, your screen and keyboard will almost certainly be sitting at the same level. You commonly spend several hours daily in this position. One day you notice that your hands/arms/neck/name your own body part/ is a bit sore. You blame it on something you did in the weekend and carry on working. A couple of weeks later the pain is still there, in fact, it is worse – but you’re got work to do, so you get an anti inflammatory from a pharmacist and soldier on. Eventually, your injury is chronic and you can’t carry on. Welcome to the world of hurt called RSI. Prevention is the definitely the best plan when dealing with RSI. Assuming that you haven’t already injured yourself , you can definitely take action to prevent doing so. Firstly, it is important to know that there are two main reasons for a typing related RSI – your typing posture, and the length of time you spend in it. The longer you spend sitting in front of a computer, the more critical it becomes that your posture is good. There are two pieces of equipment that you absolutely need; a decent chair and a keyboard that is separate from your screen. Chair – it should be height adjustable and have a supportive back. There are many different chairs available that meet these two criteria. (Link to examples on Amazon.) However, you can also improve your existing chair if necessary, with some clever add-ons like the DuraMed Back Support or the BackJoy seat. 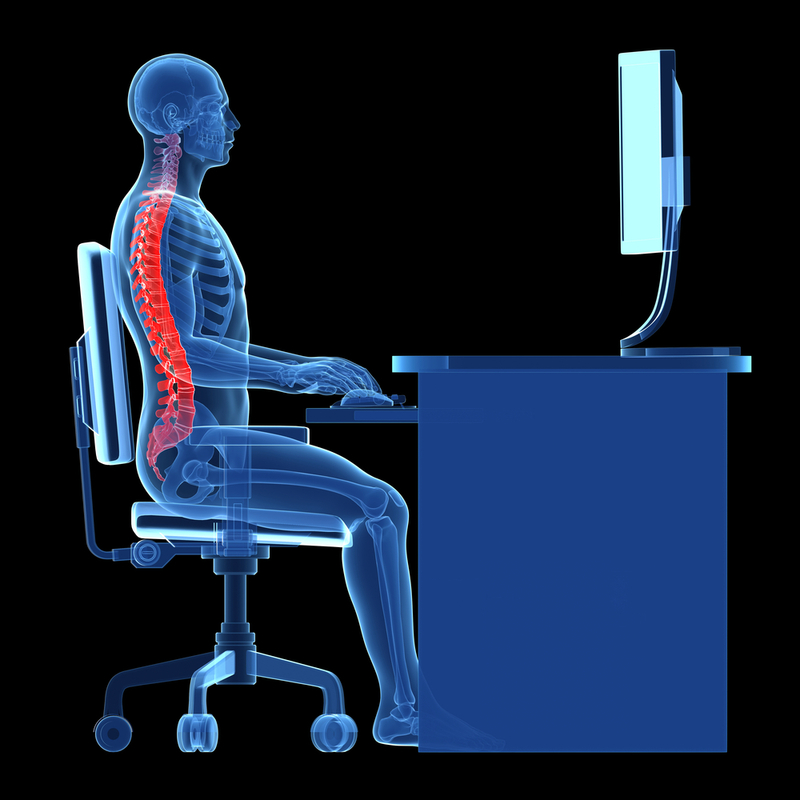 There are lots of detailed guides available online to help you setup a healthy sitting posture at your computer. We have summarised the main points below, but you can see a more in-depth description here if you need clarification. 1. Chair – set the height so that your feet are flat on the ground and your knees are bent at approximately 90 degrees. Sit back so that your lower back touches the seat back. 3. Keyboard and mouse – ideally the keyboard needs to be at a height that allows your elbows to bend at 90 degrees (with your shoulders down and relaxed). You do not want to have to lift either your shoulders or hands above this low and relaxed position. An ergonomic posture is simply not possible at your kitchen table. In most cases you will need to invest in an adjustable keyboard tray. These will allow you to keep a relaxed wrist and hand position. As Professor Alan Hedge, Cornell University, says “a negatively sloped adjustable keyboard tray maximizes neutral hand, wrist and upper body postures.” If you want to avoid carpal tunnel syndrome, you need to do this. (Link to some adjustable keyboard options.) You can even find examples that can be fitted to your kitchen table! If you create a healthy typing posture (as described above), you are 90% of the way to staying pain free. However, there are a few other factors that need to be considered. Stay relaxed – periodically, take stock of whether you are holding tension in your neck, shoulders, forearms, wrists, and hands. You should ideally get up and move around at least every 20 minutes or so. If this is too difficult (! ), at least ensure that you drop your shoulders and stretch and move your arms and hands. Keyboard position – your keyboard needs to be centered with the “b” key directly in front of you. Ideally it will have a slight negative slope to allow your wrists to stay relaxed and straight. Avoid working stressed – there are several studies that link RSI to working in a stressed state. Stress has many different effects on the human body including promoting injury and heightened perception of pain. Sit less – consider the option of a standing desk. These can be set up to be ergonomically effective and provide a change from sitting. This option is not possible for everyone, but for those serious about their postural health, they are worth looking into. If your RSI is relatively minor, following the advice above will probably be helpful. However, if it has gotten to the point where the injury is chronic, you will need to see a health professional. They will be able to treat the injury with a combination or anti-inflammatory drugs and physical therapy. The same tactics that work with any injury, for example a sprained ankle, will work with an RSI. Of course, if you simply continue typing in the same way as you always have, your injury will not heal. You need to make some changes!